White paper on crime 2001 Part 1/Chap.1/Sec.3/3. Fig. I-13 shows the trends in the number of persons newly received by public prosecutors offices over the last decade for obstruction of compulsory execution, obstruction of auction or bids and Bankruptcy Law violations. These offenses related to bankruptcies usually occur over the collection of bad debts. In particular, collection of bad debts owned by failed financial institutions has become one of the biggest problems in the Japanese economy. Under the Law Concerning Emergency Measures for the Revitalization of the Financial System (Law No.132 of 1998), the Resolution and Collection Corporation (hereinafter called"RCC") collects and resolves bad debts purchased from financial institutions, whether they are already failed or not. In order to rigorously pursue criminal responsibility for offenses related to collection of bad debts owned by failed financial institutions, directors of the RCC, etc. should take necessary actions for charge of such offenses under the Law. In FY 2000, the RCC, etc. brought charges in a total of 29 cases (64 persons), of which 24 were cases involving borrowers (43 persons) and 5 were cases involving loaners (21 persons). Among the cases involving borrowers, 6 cases (9 charged persons) were for obstruction of compulsory execution, 11 cases (23 charged persons) for obstruction of auction or bids, 1 case (1 charged person) for making a false entry in an officially authenticated instrument, 5 cases (9 charged persons) for fraud, and 1 case (1 person) for another offense. Among the cases involving loaners, 4 cases (15 charged persons) were for breach of trust or aggravated breach of trust and 1 case (6 charged persons) for another offense (Source:Deposit Insurance Corporation). 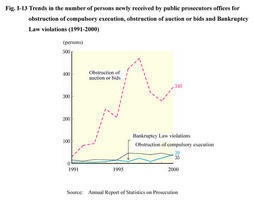 Table I-12 shows the trends in the number of persons prosecuted or not prosecuted by public prosecutors offices over the last five years for obstruction of compulsory execution, obstruction of auction or bids, and Bankruptcy Law violations. In 2000, of those prosecuted persons, formal trials were requested for 11 persons and summary orders were requested for 5 persons for obstruction of compulsory execution. As for obstruction of auction or bids, formal trials were requested for 113 persons and summary orders were requested for 86 persons. With respect to Bankruptcy Law violations, formal trials were requested for all persons prosecuted.